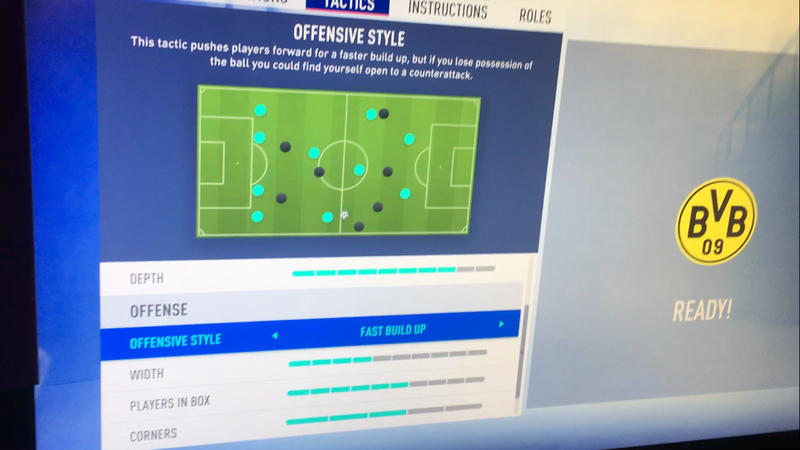 I have a blurry screenshot of a tactics screen from FIFA 18 on my phone. I use it to remember the numbers I need—speed, pressure, and so forth—so that I can quickly input them before a match. But as of FIFA 19, it appears that screenshot is now completely obsolete. One of the big under-the-hood changes in FIFA 19 is a new approach to tactics. Instead of granular numbers that slide from 0 to 99, there are much more generalized categories like "width" and depth." There are five categories in total—three for offense and two for defense—and include styles like "constant pressure and "fast build up." Here's a quick look at what the new tactics screen looks like it. Additionally, FIFA 19 has basic game plans that roughly conforms to defense, balanced, and attacking play styles. These are clearly meant for new players, but I wouldn't necessarily recommend using them. When I chose a basic attacking gameplan, I found my players were gassed immediately. It seems that any fast-paced, high octane approach will take a heavy toll on fatigue. By the 60th minute of my PSG, Spurs tilt, Cavani, and the rest were down to red fatigue, something I've rarely seen in previous games. Changing up the tactics screen will make it harder for experienced players to min-max their formations, though it's not impossible. I fully expect YouTube tutorials to pop up almost immediately with the best possible gameplan settings. On the whole, I think it's an improvement. Having extremely in-depth control over my team's build-up and defense was fine, but it was a bit much trying to remember and input very specific numbers and instructions before a match. Despite being extremely important for gameplay, the tactics screen tended to be neglected while playing with friends on the couch. Perhaps that will change with FIFA 19. The action on the whole feels slower and more tactically focused. Pace definitely still matters—Neymar and his ilk are more than capable of getting in behind the defense—but I found that trying to put on relentless attack was generally detrimental to my chances. Those hoping for a more free-flowing experience after the stifling FIFA 17 and FIFA 18 may well be disappointed. Nevertheless, new systems like 50/50 battles and "Active Touch," which governs who wins a first touch, makes the action feel more nuanced than it has in the past. My players were constantly bumping and fighting with those of my opponent, giving FIFA 19 an even more physical feel than before. I had a hard time working the ball through the midfield. The wings, however, were wide open. It was a constant battle to keep my fullbacks from being overrun by speedy wingers getting in for the cross. The shooting has been changed up, and I'm still getting used to the overall balance of it. The new system has an invisible timing element that governs whether or not you get in a good shot. If you are able to nail the timing of pressing the shot button a second time, you will have a very good chance at a goal. It seems as if EA is doing this to downplay the significance of the Power Shot and the Flair Shot, which have dominated FIFA at different points of its history. In the short term, I expect new players in particular to struggle a bit with this new system. Crosses feel very different. They feel harder than ever to pull off while running, and the timing on charging them up has changed. My crosses were almost always short or sailed over the head of my striker. I'm still figuring this one out. I was having a hard time finding set-piece tactics in this build, but they're apparently still there. Not only that, but you can apparently choose how many players get into the box, which adds a nice risk-reward element when trying to score versus guarding against counters. As you may have seen, FIFA 19 finally has the Champion's League license, and that means new commentary. Former Arsenal player Lee Dixon and BT Sport commentator Derek Rae step into the commentary booth and do a capable, if fairly simple, job of calling the game. If it's anything like the rest of FIFA, they will be limited to Champions League matches, with the regular commentators returning for EPL matches. In general, I felt like there was a lot to chew on after playing FIFA 19 on PS4. Everything felt different, from the way the players interacted to the shooting. My old tactics definitely didn't work. It's still FIFA, obviously, but those looking for a deeper, more interesting experience may finally be getting their wish. Stay tuned for more thoughts on FIFA 19 as we continue to cover E3 2018 here in Los Angeles. 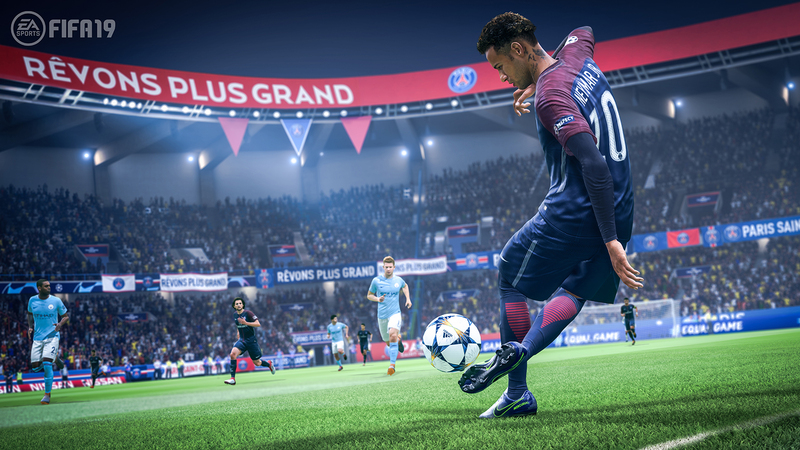 And of course, make sure to check out our guide to everything we know about FIFA 19. Tagged with Analyses,	E3 2018,	Electronic Arts.